Check out our latest Armor8 videos for more information on our latest product! ARMOR8 is driven by design thinking and a deep commitment to preserving the human touch. It is on a relentless mission to design, manufacture and market a diverse range of products, services and solutions for the hygiene conscious. 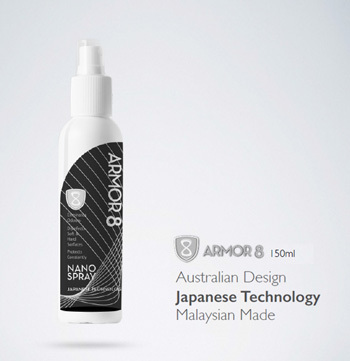 ARMOR8 is powered by Smartcoat, one of the leading manufacturers and service providers of Titanium Dioxide. Germs can last more than 2 hours on any surface. Viruses have been found up to 24 hours after contact. 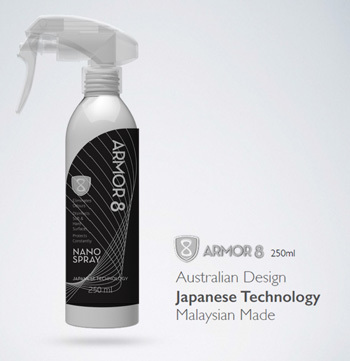 ARMOR8 is a unique formulation that deodorises, sanitises and eliminates germs, bacterias and viruses. ARMOR8 is long lasting up to 30 days and is non-toxic as well as environmentally friendly. People-oriented design thinking is the idea behind ARMOR8. The focus is on creating the best consumer experience and confidence. Inspired by the human body, ARMOR8 strives to find the perfect balance between simplicity and innovation, creating products that are uncompromisingly simple yet effective. INSTANT PROTECTION ARMOR8 is easy to use in 3 simple steps. A very fine layer of caring will be applied to all surfaces. This one time application will last up to 30 days. ARMOR8 when applied, utilises a process called Photocatalyst,. It has an oxidative ability when exposed to light that will eliminate odours in the air, kill bacteria and decompose organic matter. We offer ready-made or custom solutions through collaboration with our customers to create the best customer experience and confidence.